Wall hooks can be both practical and stylish at the same time – you just have to think outside of the square! Various designs of this home decor trend have been popping up all over Pinterest, so today we’ve actually rounded-up 40 DIY versions! From wood and paper mache, to old hardware tools, door knobs, animal figurines, and crystals (just to name a few) – you’ll find a wide array of crafty tutorials which showcase the best of the best when it comes to creating your own wall hooks. It’s time to get your creative juices flowing by diving into the following projects! Did you know that you can re-purpose old cupboard door knobs as wall hooks? The talented girls at A Beautiful Mess will show you how! Here’s a thrifty DIY wall hook idea that won’t cost you very much at all! A Little Glass Box has used old wooden clothes hangers for a unique look. Here’s a very cute wall hook idea for a children’s room, thanks to Ana White. You can recreate these adorable animal face hooks by following this full tutorial. Trust Aww Sam to come up with DIY wall hooks which are this fun! Fancy some flamingos on your wall? Check out this step-by-step guide for more. Got some old records laying around at home? You can now turn them into DIY wall hooks thanks to this great idea from Better Homes and Gardens. Stones are such a cheap and easily attainable craft item – you can even find them in your own backyard! Better Homes and Gardens will show you how to turn them into awesome wall hooks. If you want to create a fun animal-inspired coat rack for your kid, then look no further than this DIY tutorial from Bright Nest! We love its quirkiness and bright colors. You can also use a faux antler as a wall hook, just by following these instructions from Camille Styles! We love the addition of gold paint too. Love elephants? How about spray-painting some elephant figurines in gold before turning them into gorgeous wall hooks, just as Cohesive Randomness has done? Creatively Living Blog used some colorful glass insulators and turned them into wall hooks which resemble a work of art! Want to make one for your own home? Be sure to check out the full tutorial. Even branches can be turned into DIY wall hooks – you just need some paint, glue, and you’re basically ready to go! Dekolehti will show you how it’s done. Who doesn’t love the colorful and dreamy layers of Agate? Desert Domicile actually turned these Agate slices into awesome wall hooks! Need something thrifty to do with your old trophies, rather than simply throwing them out? Design Sponge will show you how to turn them into sporty DIY wall hooks! Domicile 37 found some cool items at a thrift store and turned them into this DIY giraffe wall hook – how clever! We love it either in its natural state or painted yellow – which one do you prefer? Artist Dominic Wilcox turned some paintbrushes into wall hooks for one if his exhibitions and it has inspired many DIY fans! Why not also take inspiration from his work and try to recreate your own? Love lollipops? Take that adoration of the sweet treat and put it on your walls, thanks to these DIY lollipop stick wall hooks from Fall For DIY. Yum! How fun do these DIY children’s wall hooks look? Giddy Giddy created these playful designs but has also shared her full tutorial with you so you can recreate your own! These stunning wooden mountains are actually wall hooks, and they’re not that hard to create! Although it’s not a DIY tutorial, be sure to check out this listing from Hachi and Tegs for inspiration so you can recreate your own. Who knew old screwdrivers could look so amazing? Homemade Modern has actually turned them into fantastic DIY wall hooks that you’re sure to love. Check out the full tutorial for more information! Love horses? Horses and Heels has used some horse figurines and turned them into classy DIY wall hooks. You won’t want to miss this tutorial! Add some Scandinavian style to your wall with these DIY birch hooks from Inspired By Charm. They’re super easy to create and you’ll be hanging stuff on them in no time! Add a vintage touch to your walls, along with your favorite inspirational verses, just by following this tutorial from Inspired by Family. Don’t they look pretty? Wow, this clay hand looks incredible! Instructables will show you the step-by-step guide to creating your own amazing DIY hand wall hook. Dinosaurs are quickly becoming an on-trend home décor item, so now you can also create wall hooks out of them! Instructables will show you how it’s done. How great do these DIY triangular wall hooks from I Spy DIY look? We love the monochromatic color scheme too – so trendy! These DIY honeycomb wall hooks from Jenna Burger look pretty cool! You can paint them in any shades of paint that your heart desires too. Here’s some more DIY hand wall hooks, this time using a paper mache method! These are both fun and easy to make, so be sure to follow the tutorial from Making Nice in the Mid-West. These geometric wooden wall hooks are amazing! Who knew that you could so easily make them yourself? ManMade DIY will show you how. Martha Stewart has a wonderful tutorial to teach you how to create these DIY animal tail hooks. They’re adorable and are the perfect addition to any children’s room. You can also create DIY wall hooks which look like dice – how magnificent! Melissa Ting has this clever and in-depth guide for you. Wow, these DIY crystal wall hooks from Minted are gorgeous! They’d look fantastic in any space and would even make a fantastic gift for loved ones. Here’s another fun dino wall hook idea, this time featuring an inspiring idea from Natalie via Musely. Use this image as a guide to recreate your own! You can also use ornate knobs as wall hooks, just as Pop Sugar has done. Choose the prettiest ones that you can find and turn them into practical home décor! Here’s a fun DIY wall hook idea that every little (or big) boy will love! You can find inspiration for this project via Recyclart. Remodelista will show you how to create funky DIY wall hooks using wooden toy blocks. You can add color to them for a fun look too! Plastic animal figurines make the best wall hooks, don’t they? Say Yes has created another treat using this crafty item, this time painting hers in pink for a nursery addition. Cacti are all the rage now, so imagine how excited we were to discover DIY cacti wall hooks from Shoes Off Please! They’re fun and funky. For a vintage inspired look, The Home Depot Blog has created these DIY wall hooks using antique door handles. They look stunning, don’t they? Here’s some more DIY animal tail hooks, this time featuring a different design by The Turquoise Piano. What a delightful project! Re-shaped spoons make wonderful DIY wall hooks too, just as The Woodgrain Cottage will demonstrate! Use antique inspired spoons for this gorgeous look. 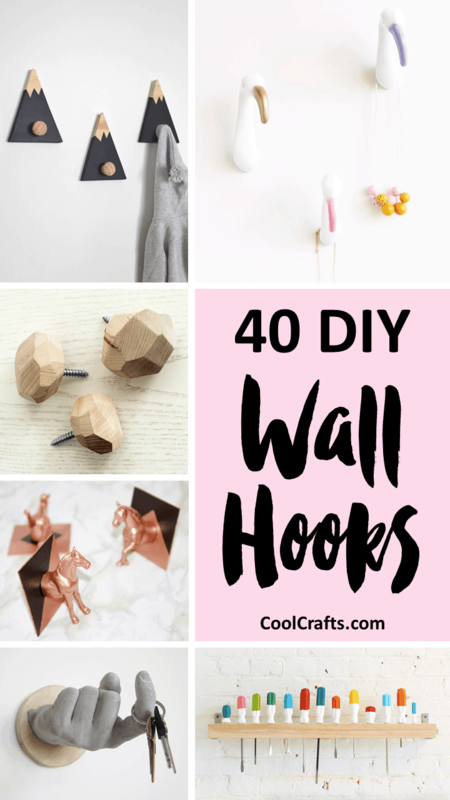 There you have it – 40 DIY wall hook projects that you’re sure to love! Which tutorials were your favorites?